Here we go again with national health care reform. But given the large gap between policies favored by Californians and those of the GOP in Washington, D.C., there is every reason for the Golden State to chart it’s own health care course. After all, the ACA was a compromise developed to satisfy conservative Democrats from red states and reach agreement with insurers. State Senator Ricardo Lara has introduced Senate Bill 562, in order for California to set its own course and “to lead,” as he put it. A single-payer system can be thought of as Medicare-for-all, in which the government pays health care providers rather than private insurers. We have been here before. A similar single-payer initiative, sponsored by the California Nurses Association in 1994, was defeated by massive insurance industry spending, and two other single-payer bills were passed by the legislature but vetoed twice by then-Governor Arnold Schwarzenegger. Turns out it's easy for a Democratic legislature to pass single-payer under a Republican Governor, but even with a Democrat in office, it’s success is far from guaranteed. So an urgent task for advocates is to convince Gov. Jerry Brown that now is the time. What's different now? First, no matter what form ACA “repeal and replace” ultimately takes, Californians are not going to let Democrats just blame the GOP when Democrats control all branches of government here. Nor should they. If the ACA was a compromise with national political forces, there’s no reason California should just try to patch it up after it’s dismantled. Nor would it be easy to ask those who currently have health care benefits to fully pay for any loss of coverage they might suffer in the wake of GOP-led health reform. From a policy perspective, the complexity of the ACA’s financing and expansion of coverage can be replaced by the simpler mechanism of single-payer, which achieves greater cost savings and broader patient choice, while retaining comprehensive benefits. The fiscal issue facing California policy makers is not how much does single-payer cost initially. That is simply a reflection of the overall costs of health care in California. The issue is how we pay for health care, and how costs will be controlled going forward. Studies have consistently shown that single-payer saves money compared to the private insurance-based system. Single-payer offers the advantage of consolidating nearly all health care spending into a single program. Such a program would then pay providers based on negotiated provider rates, capital budgets for health facilities, and consolidated prescription drug purchasing. Public financing would come from payroll and income premiums paid by individuals and businesses, and would replace existing insurance premiums, deductibles and co-pays. Given that the U.S. spends twice per capita what the average industrialized country spends on health care, there’s plenty of money in the system. But too much — 20 to 30 percent — is wasted on administrative inefficiencies in the form of marketing, billing systems, and profits. Single-payer eliminates that waste. It preserves the mostly private delivery system but uses the leverage of a single-payer to control prices. As the sixth largest economy in the world — bigger than other countries with national health systems that guarantee health care as a human right — we have the resources to make that guarantee in California. Faced with the new federal reality, single-payer is the only way to cover all of California’s remaining uninsured, and provide security to those who now have insurance but face huge out-of-pocket costs, limited choice of providers, and inadequate benefits. Since there is much talk in Washington, D.C., these days about how states’ should have the resources and flexibility to cover their residents, we can anticipate that California will have the flexibility to implement a system of our choice. If states such as Indiana and Kentucky are allowed flexibility to adopt versions of health reform to fit their needs, California should be allowed to do the same. Rather than only protect the Affordable Care Act’s status quo by replacing lost federal revenue with new state taxes and spending, California can establish a new standard — guaranteed health care for all as a human right. That includes the undocumented. This is not your ’90s health reform movement. 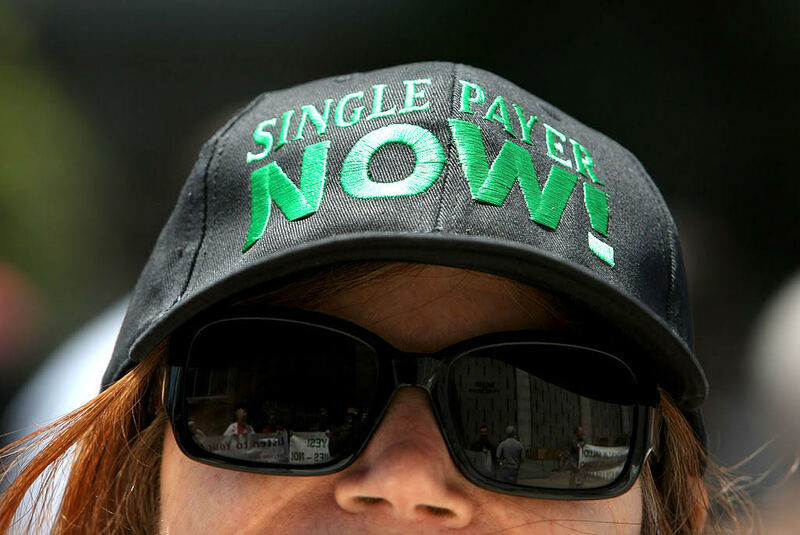 Single-payer has emerged as the only way to guarantee health care for all residents. What better issue for California to lead on? Michael Lighty is the director of public policy for the California Nurses Association. Mr Mighty is absutely correct. When reactionary politicians say "we can't afford it?" I always respond by saying "how much MORE is LESS?!" When we're allowing Wall Street traded Insurance corporations skim hundreds of millions off the current system, it's obvious public funding would be infinitely more efficient. Go California be our model! I live in New Mexico and we are 20 years behind in EVERYTHING! If any state can do it you can!!!! With Kaiser a heavy presence in CA and all of there Evidence based practice research, way ahead of rest of the country in being ready to set standards! The private practice, MD only, insurance reimbursement for "the more stuff you do, tests your order, surgeries you perform but not for keeping folks healthy/outcomes oriented" is what has not been working for years. Countries with much better mortality & morbidity rates are single payer and practice collaboratively.